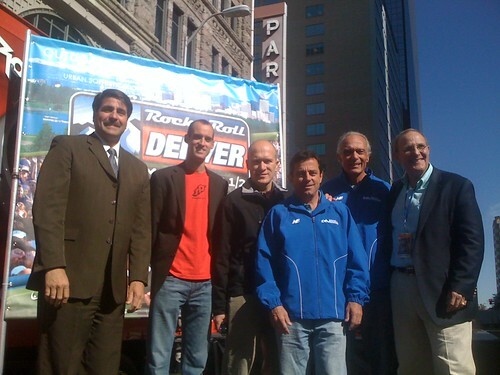 Denver, CO – January 12, 2010 – The Competitor Group (CGI) today announced that online registration has opened for the inaugural Rock ‘n’ Roll Denver Marathon and Half Marathon. The race, scheduled for Sunday, October 17, 2010, is expected to draw over 15,000 runners and will feature entertainment along every mile of the scenic course. The Mile High City will come alive with runners and spectators creating a community-wide celebration that culminates with a rockin’ post race celebration at the Finish Line Festival in Civic Center Park. 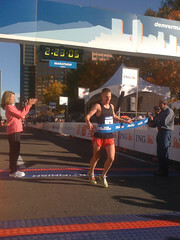 The 2010 event will utilize the existing Denver Marathon race course that begins in front of the State Capitol, and travels past many of Denver’s major landmarks including the Denver Public Library, Art Museum, Larimer Square, the Pepsi Center, Union Station and Coors Field, as well as City, Cheesman and Washington Parks. The course has little to no elevation change and is certified by USA Track & Field as a qualifier for the Boston Marathon. Online registration for the event is open at www.runrocknroll.com. The first 500 runners to register for the inaugural Rock ‘n’ Roll Denver Marathon & ½ Marathon can take advantage of special entry fees, which will offer registration for the half and full marathon events at $55 and $70, respectively. Event weekend will begin on Friday, October 15 with a two-day Health & Fitness Expo at the Colorado Convention Center. The free Expo, where all participants pick up their race number, t-shirt and timing tag, will feature up to 100 exhibitors with samples, the latest in running gear and sports apparel, and a full schedule of interactive clinics. Last October, the Denver Marathon announced becoming the Rock ‘n’ Roll Denver as part of a national series of fourteen musically themed marathons and half-marathons. Launched in 1998, the groundbreaking concept uniquely combines entertainment with a 26.2-mile road course. The series, which originated in San Diego, includes events in Phoenix, Nashville, Seattle, Chicago, Virginia Beach, San Jose and San Antonio. For more information or to register for the Rock ‘n’ Roll Denver Marathon & ½ Marathon, please log onto www.runrocknroll.com or call 800-311-1255. Produced by The Competitor Group, the Rock ‘n’ Roll Marathon series is known for lining race routes with live bands, cheerleaders and themed water stations. The original Rock ‘n’ Roll Marathon in San Diego is still recognized for its record setting inaugural event that brought 15,771 participants across the finish line. Today, the Rock ‘n’ Roll Marathon Series has spread to fourteen cities nationwide, creating the first national series of marathons and half-marathons, which annually attract more than 300,000 participants. For more information, please visit www.runrocknroll.com. Competitor Group, Inc., headquartered in San Diego, CA, is a leading endurance media and event entertainment company dedicated to promoting the sports of running, cycling and triathlon. CGI owns and operates 36 national events delivering more than 350,000 professional and amateur participants in 2010. CGI publishes four magazine titles with a combined monthly circulation of over 800,000 and has recently launched an online endurance community at competitor.com delivering over 1.5 million monthly unique visitors and over 25 million page views. Further information about Competitor and its media properties can be found at www.cgimediakit.com .